There’s a sense of déjà vu to today’s stage. Like yesterday, it lasts a similar distance, consists of a flat first half, and includes three climbs crammed into the second half. All but 10 of the 60 kilometres to the finish line uphill. The first two climbs — Sant Antonio and Rocchetta Sandri — are both more likely to whittle down the peloton rather than launch attacks, as the big names will wait for the Passo del Lupo to make a move. Although officially only 10.7km long, there is another 10km of climbing before the foot of the Lupo, meaning this stage finish could take some by surprise. The gradient is steady up until eight kilometres from the finish, when it kicks up to 8.8 per cent. With so much climbing already in their legs, the riders will be tired at this point, and anyone on the limit will likely be dropped. The climb continues at the same gradient for several kilometres before peaking with a brief stretch at 13 per cent, after which it plateaus to four per cent for four kilometres until the finishing line. 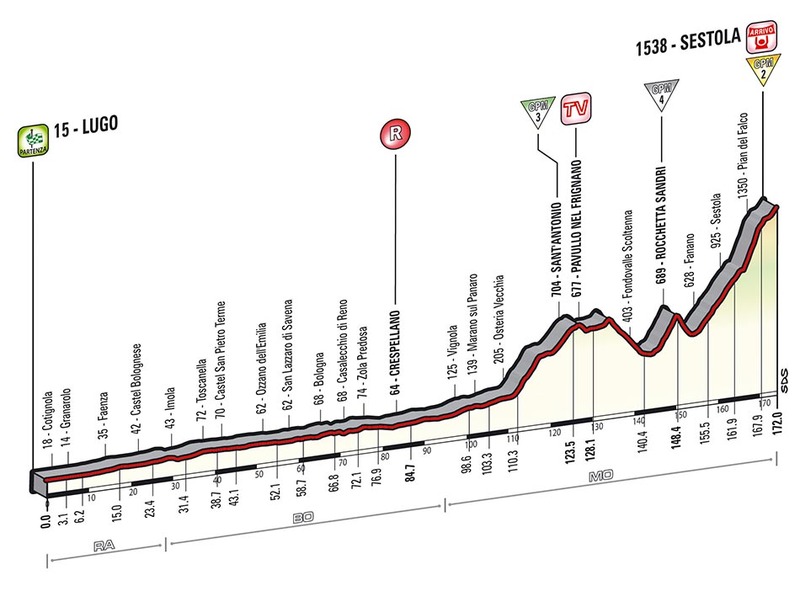 One thing’s for sure: the ultimate winner of the Giro will be near the front at this peak. Before today’s climbing, the peloton passes through Bologna, which is, of course, home of bolognese sauce (or ragù, if you want to sound down with the locals). However, the city’s cuisine transcends the infamous sauce and is considered one of the finest in Italy — so much so that the city is nicknamed La Grassa, which translates as ‘the Fat One’.